Managing a company used to be straightforward: make profit. But nowadays, more is required. Companies are expected to create positive value for their clients, employees and society at large, while at the same time minimizing their negative impacts. However, current reporting mainly focuses on measuring profit for shareholders. A new guideline, Framework for Impact Statements, developed by Impact Institute, makes it possible to calculate and report on societal profits & losses. The Framework helps businesses and institutions show the value creation for their clients, their employees and the community in which they operate, in addition to the financial value for their shareholders. The framework was prepared based on the experience of Impact Institute and its partners, including ABN AMRO, AkzoNobel, Alliander and DSM. It builds on international conventions and frameworks and reflects the international trend towards measuring impact, in which several Dutch companies are leading. ABN AMRO is the first bank in the world to publish its Impact Report based on this new framework. 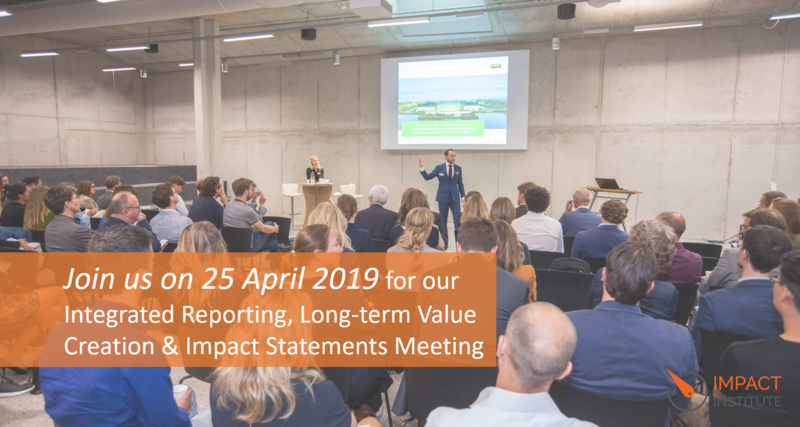 We welcome you to attend our Integrated Reporting, Long-term Value Creation & Impact Statements. Please note there are limited seats available, therefore we request you confirm your attendance via event@trueprice.org. We will confirm your attendance and share more details closer to the date. Working in partnership with ABN AMRO, we look forward to welcoming you on the 25 April at CIRCL! The location is easily reached by public transport (Zuid Station).